Hello again, and welcome to another challenge with the Paper Craft Crew! Notice anything new? That’s right – I used lots of new products! First, I started with a card base of Emerald Envy cardstock. Next I took a panel of Very Vanilla cardstock, and using the new Painter’s Palette stamp set, stamped the paint splashes in Emerald Envy and Sweet Sugarplum inks. Next I added a square of Playful Palette DSP . I used the Big Shot and the Butterflies Thinlits to die cut the butterfly from Sweet Sugarplum cardstock, and then used the Swirly Scribbles Thinlits to die cut another pattern from the Playful Palette DSP to layer over it. I then stamped the sentiment from the Sitting Here stamp set in Emerald Envy onto Very Vanilla cardstock, then used my Snips to cut banner tails on each end. 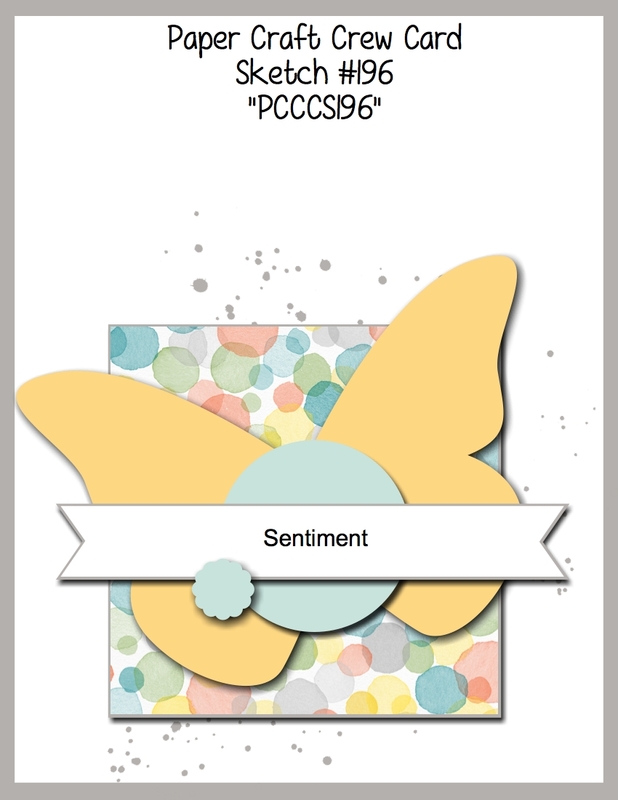 The sentiment was layered over the middle using Stampin’ Dimensionals. This card was fun to put together; I hope you’re looking forward to ordering your new products from the new catalogue! I’d love to hear what you think of this card, and the new colours/products, if you’d like to leave a comment. Then, please have a look at the rest of the Design Team’s projects at the Paper Craft Crew page, and I hope you’ll link up your card! Previous Previous post: Last Call for Retiring Products!